Since the dawn of history, various extraordinary phenomena have been recorded as happening amongst human beings. Witnesses are not wanting in modern times to attest to the fact of such events, even in societies living under the full blaze of modern science. The vast mass of such evidence is unreliable, as coming from ignorant, superstitious, or fraudulent persons. In many instances the so-called miracles are imitations. But what do they imitate? It is not the sign of a candid and scientific mind to throw overboard anything without proper investigation. Surface scientists, unable to explain the various extraordinary metal phenomena, strive to ignore their very existence. They are, therefore, more culpable than those who think that their prayers are answered by a being, or beings, above the clouds, or than those who believe that their petitions will make such being change the course of the universe. The latter have the excuse of ignorance, or at least of a defective system of education, which has taught then dependence upon such beings, a dependence which has become a part of their degenerate nature. The former have no such excuse. For thousands of years such phenomena have been studied, investigated, and generalised, the whole ground of the religious faculties of man has been analysed, and the practical results is the science of Raja-Yoga. 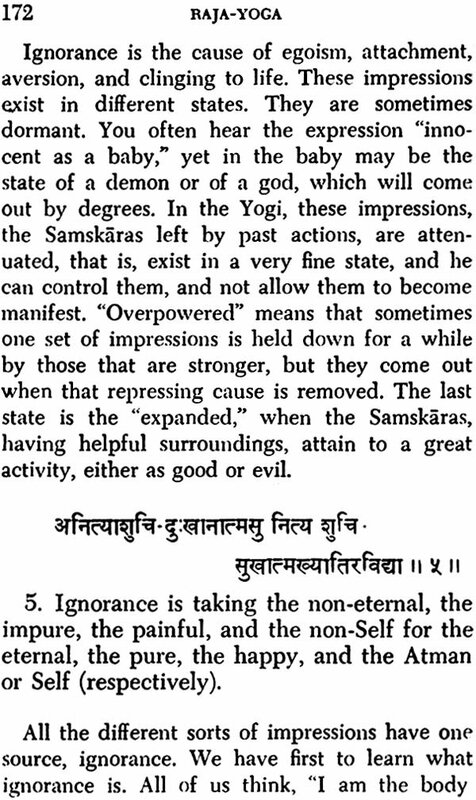 Raja- Yoga does not, after the unpardonable manner of some modern scientists, deny the existence of facts which are difficult to explain; on the other hand, it gently, yet in no uncertain terms, tells the superstitious that miracles and answers toprayers, and powers of faith, though true as facts, are not rendered comprehensible through the superstitious explanation of attributing then to the agency of a being, or beings, above the clouds. It declares that each man is only a conduit for the infinite ocean of knowledge and power that lies behind mankind. It teaches that desires and wants are in man, that the power of supply is also in man; and that wherever and whenever a desire, a want, a prayer has been fulfilled, it was out of this infinite magazine that the supply came, and not from any supernatural being. The idea of supernatural being may rouse to a certain extent the power of action in man, but it also brings spiritual decay. It brings dependence; it brings fear; it brings superstition. It degenerates into a horrible belief in the natural weakness of man. There is no supernatural, says the Yogi, but there are in nature gross manifestations and subtle manifestations. The subtle are the causes, the gross the effects. The gross can be easily perceived by the senses; not so the subtle. The practice of Raja-Yoga will lead to the acquisition of the more subtle perceptions. All the orthodox systems of Indian philosophy have one goal in view, the liberation of the soul through perfection. The method is by Yoga. 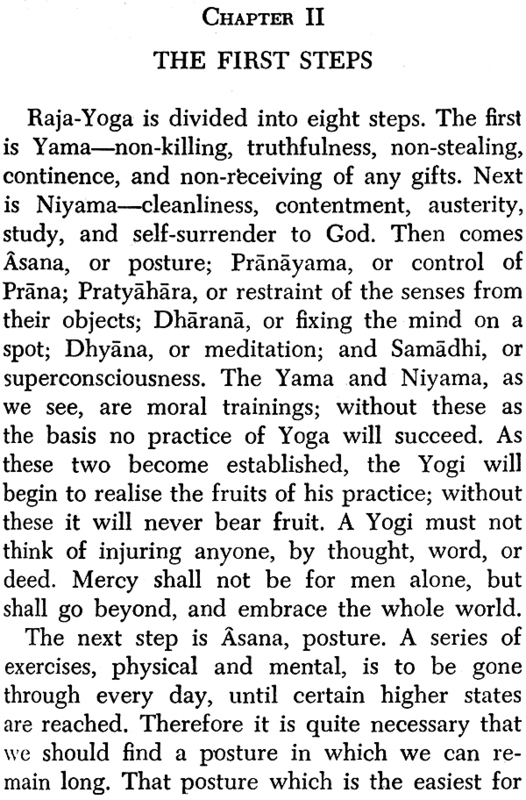 The word Yoga covers an immense ground, but both the Sankhya and the Vedanta Schools point to Yoga in some from or other. 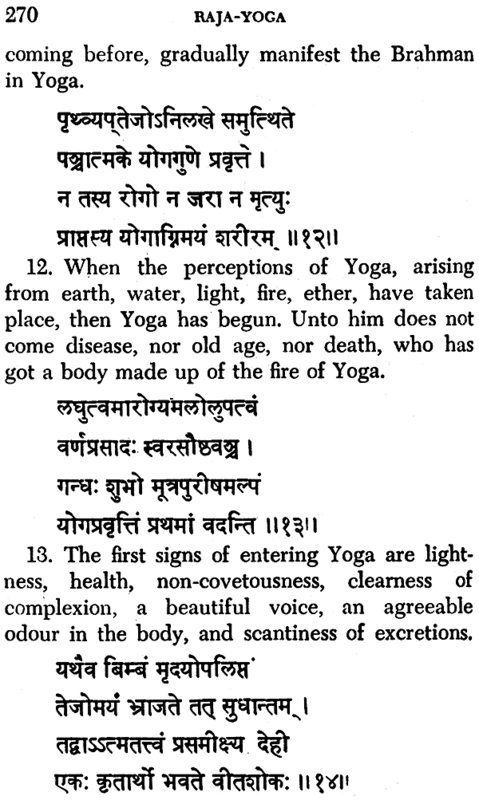 The subject of the present book is that form of Yoga known as Raja- Yoga. 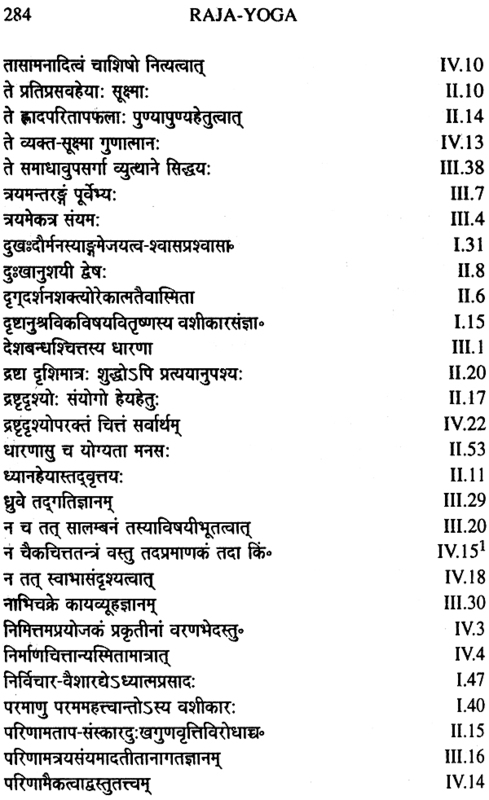 The aphorisms of Patanjali are the highest authority on Raja-Yoga, and from its text book. 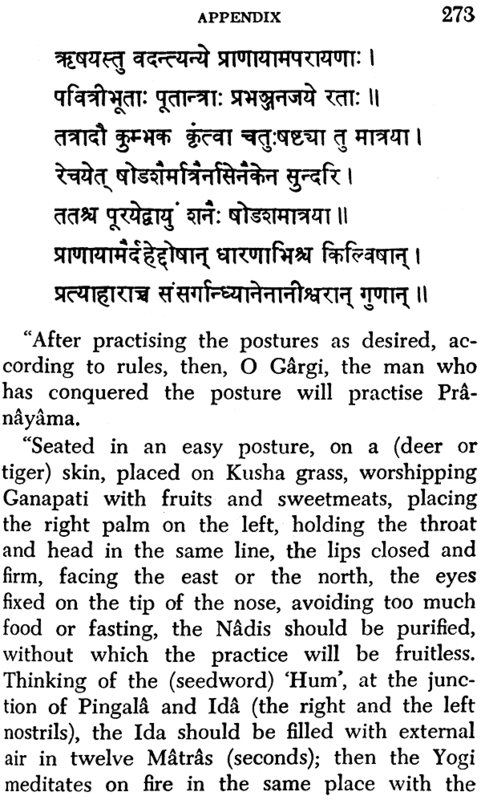 The other philosophers, though occasionally differing from patanjali on some philosophical points, have as a rule, acceded to his method of practice a decided consent. The first part of this book comprises several lectures to classes delivered by the present writer in New York. 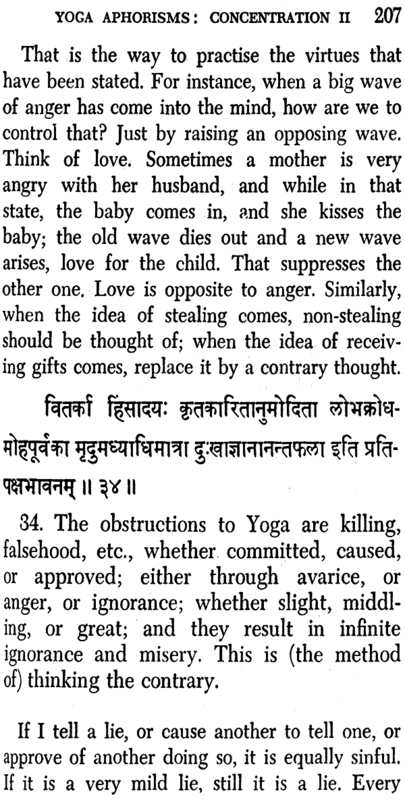 The second part is a rather free translation of the aphorisms (Sutras) of patanjali, with a running commentary. Effort has been made to keep to the free and easy style of conversation. 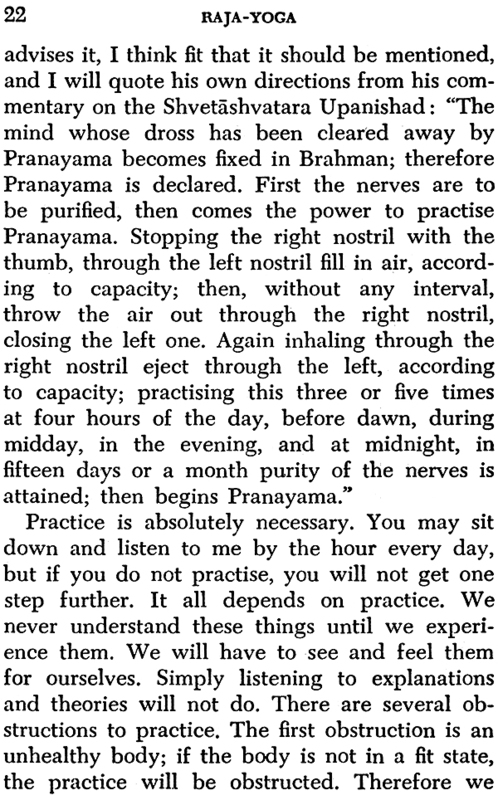 In the first part some simple and specific directions are given for the student who wants to practise, but all such are especially and earnestly reminded that, with a few exceptions, Yoga can be safely learnt by direct contact with a teacher. If these conversations succeed in awakening a desire for further information on the subject, the teacher will not be wanting. Religion, as it is generally taught all over the world, is said to be based upon faith and belief, and, in most cases, consists only of different sets of theories, and that is the reason why we find all religions quarrelling with one another. These theories, again, are based upon belief. One man says there is a great Being sitting above the clouds and governing the whole universe, and he asks me to believe that solely on the authority of his assertion. In the same way, I may have my own ideas, which I am asking others to believe, and if they ask a reason, I cannot give them any. 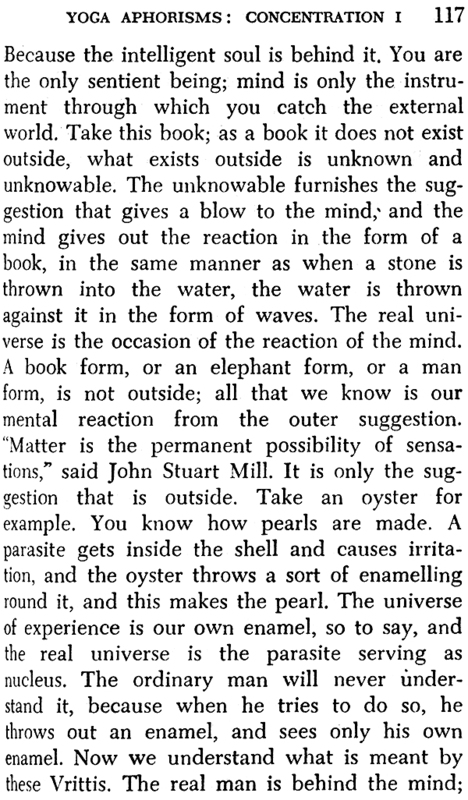 This is why religion and meta- physical philosophy have a bad name nowadays. Every educated man seems to say, "Oh, these religions are only bundles of theories without any standard to judge them by, each man preaching his own pet ideas." Nevertheless there is a basis of universal belief in religion, governing all the different theories, and all the varying ideas of different sects in different countries. Going to their basis we find that they also are based upon universal experiences. In the first place, if you analyse all the various religions of the world, you will find that these are divided into two classes, those with a book, and those without a book. Those with a book are the strongest, and have the largest number of followers. 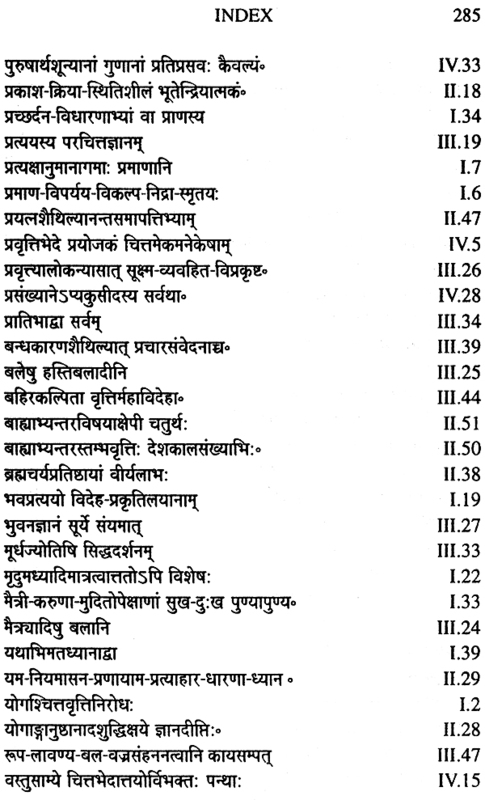 Those without books have mostly died out, and the few new ones have very small followings. Yet, in all of them we find one consensus of opinion, that the truths they teach are the results of the experiences of particular persons. The Christian asks you to believe in his religion, to believe in Christ and to believe in him as the incarnation of God, to believe in a God, in a soul, and in a better state of that soul. If I ask him for reason, he says he believes in them. But if you go to the fountain- head of Christianity, you will find that it is based upon experience. Christ said he saw God; the disciples said they felt God; and so forth. Similarly, in Buddhism, it is Buddha's experience. He experienced certain truths, saw them, came in contact with them, and preached them to the world. So with the Hindus. 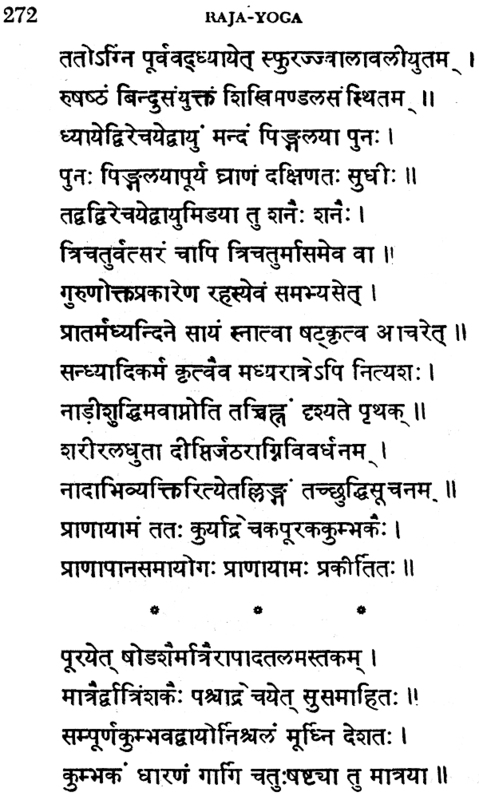 In their books, the writers who are called Rishis, or sages, declare they experienced certain truths, and these they preach. Thus it is clear that all the religions of the world have been built upon that one universal and adamantine foundation of all our knowledge-direct experience. The teachers all saw God; they all saw their own souls, they saw their future, they saw their eternity, and what they saw they preached. Only there is this difference, that by most of these religions, especially in modern times, a peculiar claim is made, namely, that these experiences are impossible at the present day; they were only possible with a few men, who were the first founders of the religions that subsequently bore their names. At the present time these experiences have become obsolete, and, therefore, we have now to take religion on belief. This I entirely deny. If there has been one experience in this world in any particular branch of knowledge, it absolutely follows that that experience has been possible millions of times before, and will be repeated eternally. Uniformity is the rigorous law of nature, what once happened can happen always. 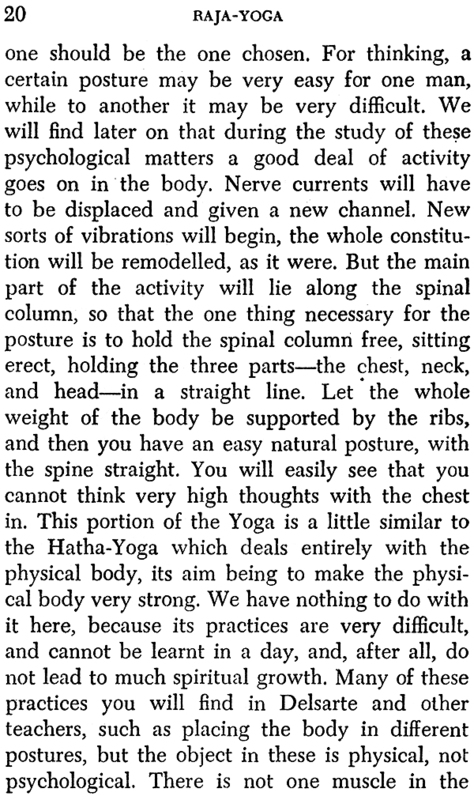 The teachers of the science of Yoga, there- fore, declare that religion is not only based upon the experience of ancient times, but that no man can be religious until he has the same perceptions himself. Yoga is the science which teaches us how to get these perceptions. It is not much use to talk about religion until one has felt it. Why is there so much disturbance, so much fighting and quarrelling in the name of God? There has been more bloodshed in the name of God than for any other cause, because people never went to the fountain-head; they were content only to give a mental assent to the customs of their forefathers, and wanted others to do the same. What right has a man to say he has a soul if he does not feel it, or that there is a God if he does not see Him? If there is a God, we must see Him, if there is a soul, we must perceive it; otherwise it is better not to believe. It is better to be an outspoken atheist than a hypocrite. The modem idea, on the one hand, with the «learned", is that religion and metaphysics and all search after a Supreme Being are futile; on the other hand, with the semi-educated, the idea seems to be that these things really have no basis; their only value consists in the fact that they furnish strong motive powers for doing good. to the world. If men believe in a God, they may become good, and moral, and so make good citizens. We cannot blame them for holding such ideas, seeing that all the teaching these men get is simply to believe in an eternal rigmarole of words, without any substance behind them. They are asked to live upon words; can they do it? If they could, I should not have the least regard for human nature. 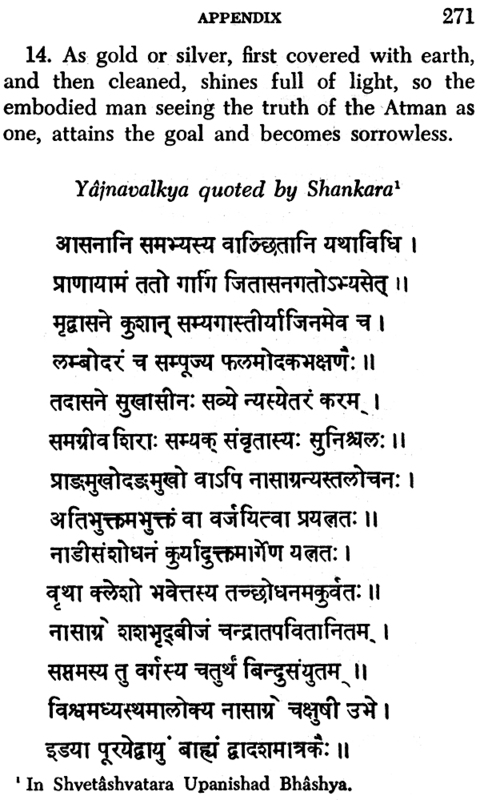 Man wants truth, wants to experience truth for himself; when he has grasped it, realised it, felt it within his heart of hearts, then alone, declare the Vedas, would all doubts vanish, all darkness be scattered, and all crookedness be made straight . "Ye children of immortality, even those who live in the highest sphere, the way is found; there is a way out of all this darkness, and that is by perceiving Him who is beyond all darkness; there is no other way." 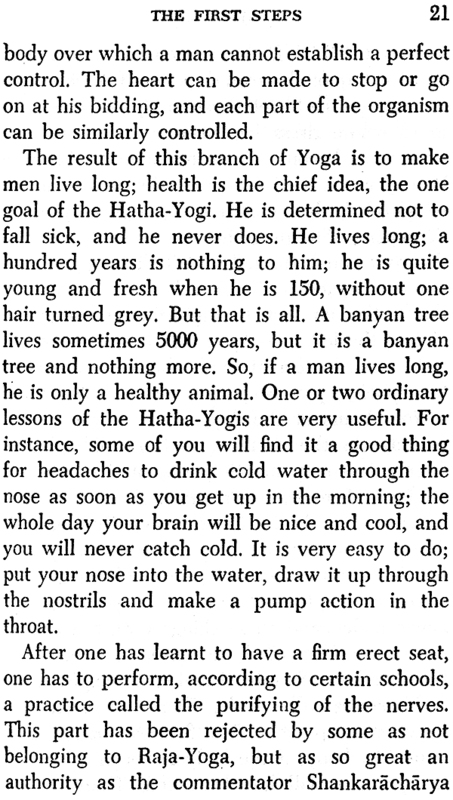 The science of Raja-Yoga proposes to put before humanity a practical and scientifically worked out method of reaching this truth. In the first place, every science must have its own method of investigation. If you want to become an astronomer and sit down and cry "Astron- omy! Astronomy I" it will never come to you. The same with chemistry. A certain method must be followed. You must go to a laboratory, take different substances, mix them up, com- pound them, experiment with them, and out of that will come a knowledge of chemistry. If you want to be an astronomer you must go to an observatory, take a telescope, study the stars and planets, and then you will become an astronomer. Each science must have its own methods. I could preach you thousands of sermons, but they would not make you religious, until you practised the method. These are the truths of the sages of all countries, of all ages, of men pure and unselfish, who had no motive but to do good to the world. They all declare that they have found some truth higher than what the senses can bring to us, and they invite verification. They ask us to take up the method and practise honestly, and then, if we do not find this higher truth, we will have the right to say there is no truth in the claim, but before we have done that we are not rational in denying the truth of their assertions. So we must work faithfully, using the prescribed methods, and light will come. In acquiring knowledge we make use of generalisation, and generalisation is based upon observation. We first observe facts, then generalise, and then draw conclusions or principles. The knowledge of the mind, of the internal nature of man, of thought, can never be had until we have first the power of observing the facts that are going on within. 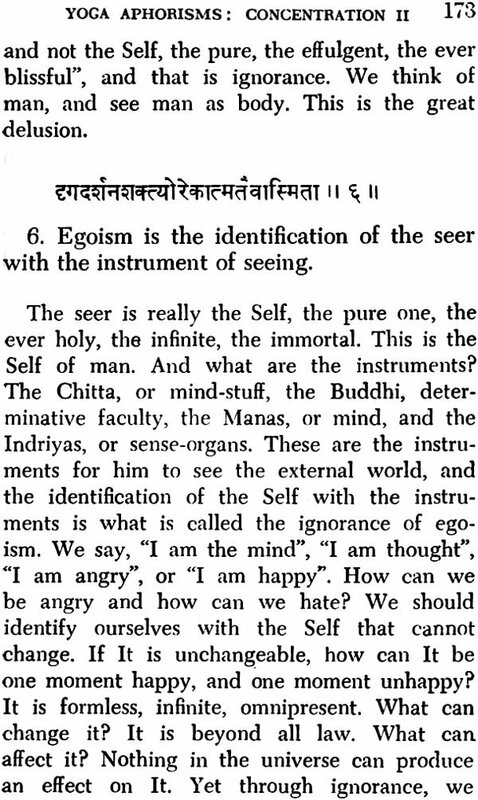 It is comparatively easy to observe facts in the external world, for many instruments have been invented for the purpose, but in the internal world we have no instrument to help us. Yet we know we must observe in order to have a real science. With- out a proper analysis, any science will be hopeless-mere theorising. And that is why all the psychologists have been quarrelling among themselves since the beginning of time, except those few who found out the means of observation. 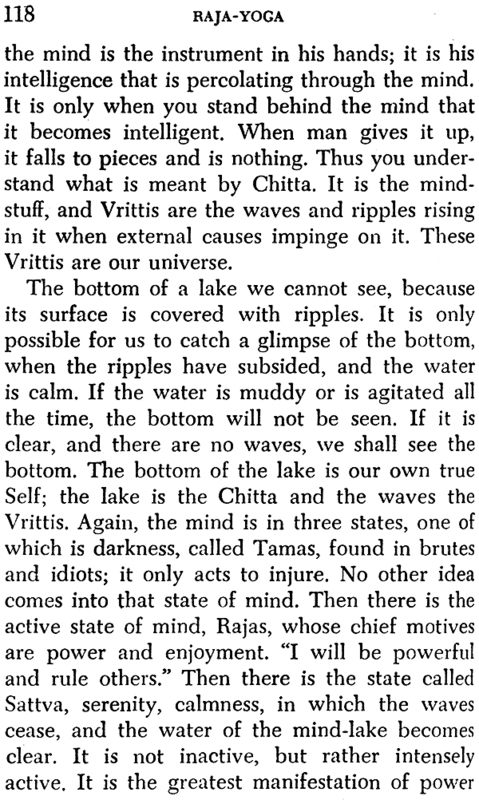 The science of Raja-Yoga, in the first place, proposes to give us such a means of observing the internal states. 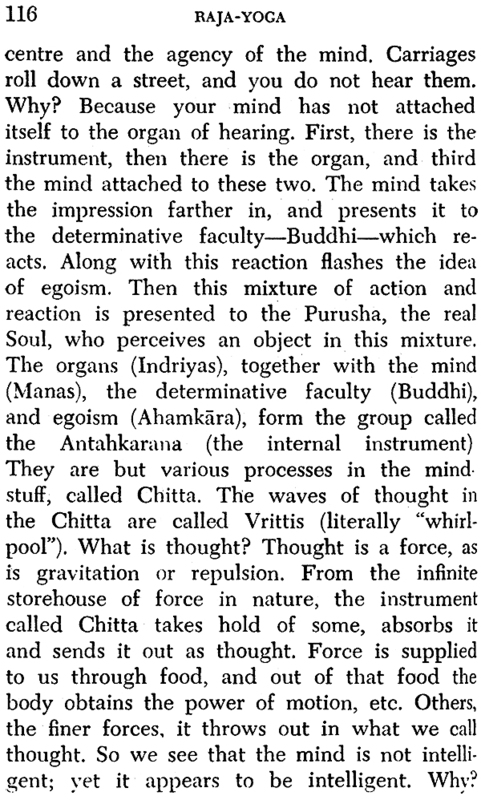 The instrument is the mind itself. The power of attention, when properly guided, and directed towards the internal world, will analyse the mind, and illumine facts for us. The powers of the mind are like rays of light dissipated; when they are concentrated, they illumine. Ibis is our only means of knowledge. Everyone is using it, both in the external and the internal world; but, for the psychologist, the same minute observation has to be directed to the internal world, which the scientific man directs to the external; and this requires a great deal of practice. From our childhood upwards we have been taught only to pay attention to things external, but never to things internal, hence most of us have nearly lost the faculty of observing the internal mechanism. 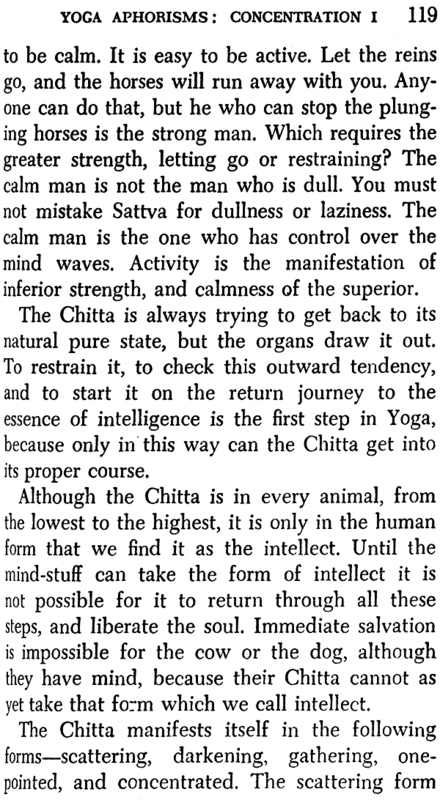 To turn the mind, as it were, inside, stop it from going outside, and then to concentrate all its powers, and throw them upon the mind itself, in order that it may know its own nature, analyse itself is very hard work. Yet that is the only way to anything which will be a scientific approach to the subject.